3) By sending email to sebamed.baby@usv.in. sebamed is world’s leading skin care expert from Germany with more than 50 years of rich experience. sebamed is the brand of choice in more than 85 countries worldwide. sebamed range of products provide you the unique advantage of pH 5.5 which preserves your skin the way it’s meant to be! sebamed products are not tested on animals. 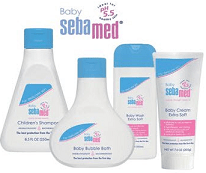 All sebamed range of products are dermatologically tested and are 100% free from soap / alkali / harsh chemicals / alcohol. Hence, sebamed products are hypoallergic, as there is 6 times lower changes of allergic reaction* with sebamed products as compared to other conventional products. Sebamed values your skin. Surely, your skin is your most valuable asset and when it comes to taking care of it, there is nothing you will compromise on. But, did you know that your skin actually has a value? Yes! The human skin has a special feature: its surface is slightly acidic and on an average the pH value of the healthy skin is 5.5. The slightly acidic surface of the skin prevents loss of moisture, keeps it soft and supple. It promotes timely renewal of skin to maintain its youthful glow. It also keeps our skin infection-free since harmful microorganisms find it difficult to tolerate this acidic pH. Sebamed product ranges include Classic, Clear Face, Baby Sebamed, Anti-Aging, Anti-Dry, Sun Care and Visio. Keep visiting www.IndiaGetFreeStuff.com to get info of more Sebamed Free Samples from time to time. Plzzz send free samples for my baby i want use your products after trial. Please send free samples for my baby i want use your products after trial. I would like to recieve free sample kit from your company. I would be very happy to receive your Sebamed Free Baby Kit Sample.